Maize is a vital crop for many New Zealand dairy farmers and represents a significant investment in time and resources. 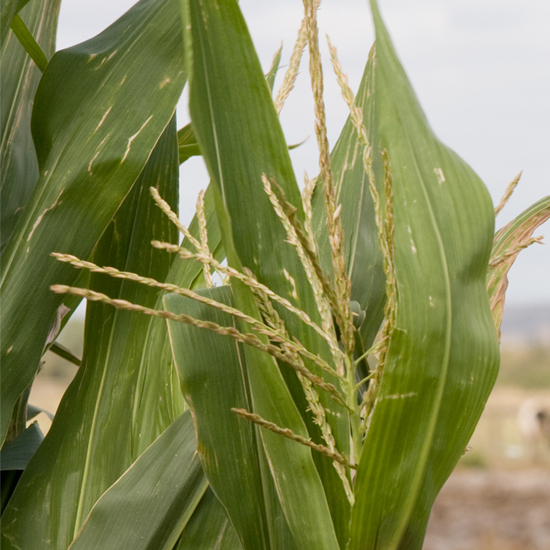 Maize grown on the dairy farm can add value to farms' feed supply, help mitigate climatic risk, extract soil nutrients from high fertility effluent paddocks, and be used as a ‘break crop’ in the pasture renewal process. Maize should be fed to fill genuine feed deficits for economic responses and be well managed to reduce feed costs and wastage. What factors affect maize yield? Sowing location, sowing date, hybrid choice and population will all influence the potential crop yield. Potential yield can be reduced by weed and pest presence, moisture stress, disease, and nutrient limitations. Ploughing is a quick and effective way to bury plant residues that might otherwise impede secondary cultivation or cause weed problems. A comment we often hear from dairy farmers is that maize is ‘hard on the soil’ and one of the main causes of this is associated with ploughing. Ploughing buries and makes fertile topsoil out of reach for new grass trying to establish after maize. Talk with your contractor about alternatives to ploughing such a discing. Be aware that you may need a longer fallow period (time between spraying out pasture and first cultivation pass); you need to balance this against the long-term damage to your soil fertility. There are other reduced tillage options for maize such as strip tillage and direct drilling, however these require more attention to detail and are best suited to specialist maize growers. Can I use dairy effluent for fertiliser? Dairy effluent can be used as a nutrient source for maize provided the crop requires the nutrients and good effluent practices are followed. If the paddock is just out of grass, the soil can supply plenty of N and further additions through effluent are probably not needed. Paddocks with a history of cropping (e.g. a dedicated cropping block or runoff) are most likely to benefit from effluent application. Maize silage grown on effluent paddocks will significantly reduce fertiliser inputs. Maize silage can also be used to extract excess nutrients from effluent paddocks, as it removes large amounts of N and K, reducing risks of N leaching and occurrence of metabolic diseases. If you are applying effluent to your maize crop, then follow good practice Best Management Practices for Growing Maize, page 14. What are the costs and benefits of maize? Maize cost can vary depending on where and how it is grown. If maize is grown on the dairy platform in an effluent paddock the cost could be as low as 12c/kg DM before storage. Maize purchased off-farm is generally more expensive. However, allowance needs to be made for the value of extra nutrients bought in with the maize and a reduction in risk due to maize being grown off the dairy platform. Maize silage can be used to support pasture-based systems at times of the year when pasture is unreliable, e.g. maize on a feed pad when soils are wet, or fed in a dry autumn to build pasture cover. On-farm feed management potentially causes the greatest variation in feed costs. For information on minimising loses during storage see the Maize Silage page. Maize silage is a maize crop cut and ensiled in a stack or bunker. Maize silage is a high-quality supplement useful for filling genuine feed deficits. For information on storage, feeding out, trading, time to ensile, minerals and interpreting a maize silage analysis see DairyNZ's Maize Silage page. Maize is one of the most efficient plants at converting radiation into biomass (1.6 tonnes DM/ha for every 100 MJ of radiation interception). Radiation is sunshine energy and radiation interception is the sunshine energy absorbed by the crop. Temperature is another factor which influences potential yield, because it affects rate of development. Warmer temperatures mean crops reach maturity faster. Temperature and radiation are different around the country. Often our growing location is fixed but if leasing or buying land for maize, investigate the site's climatic conditions. This affects radiation interception as radiation interception changes during the year. Radiation peaks late in December, so aim to sow your crop to have full canopy cover by this stage. 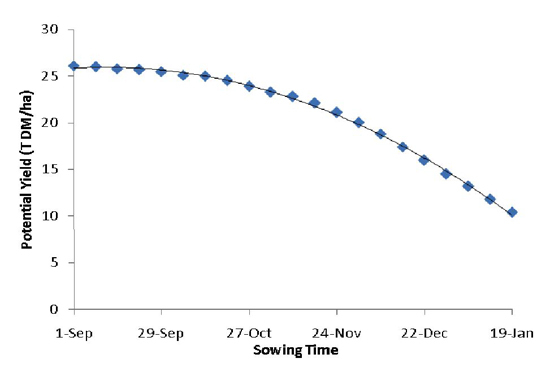 In general, early sowing has higher yields than late sowing. However, this should be balanced against many factors such as: frost risk, soil conditions and pasture harvested pre-crop. The main difference between hybrids are is the number and size of leaves (which effects green leaf area), crop maturity (number of growing degree days (GDD) before the crop is ready to harvest), and ability to cope with stresses such as drought. As a general guide, short season hybrids tend to yield less because they have fewer smaller leaves than long season hybrids. They also tend to need fewer GDD’s to reach maturity so are in the ground for fewer days. More plants mean more leaf area. Typical populations for maize silage is 100-120 thousand (k) seeds per ha. Final populations are normally 5K/ha less than what was originally sown. Other factors affecting potential yield include weed pressure, drought, waterlogging, leaf diseases, nitrogen, pests, and soil structure. 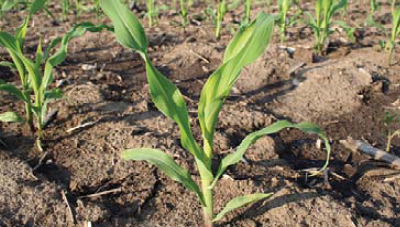 For more information see Best Management Practices for Growing Maize, pages 8-9. Monitoring is important to maximise yield. A monitoring programme should include weeds, pests, and diseases; soil N sampling, soil moisture if irrigated, and crop maturity. For the busy dairy farmers, often technical advisors and some contractors can provide this service. It is important to regularly monitor crops especially in the first two months of growth. Bird and rat damage is characterised by plants pulled and seed embryos eaten. Deep soil (0-60 cm) N testing to plan for post-emergence fertiliser. If further N is required, make sure it is applied at this growth stage. Over 20-30 December, check for army worm caterpillar if crops are weedy. Maize generally takes 50-55 days from this time to reach two-thirds milkline - an important indicator of crop maturity. Three weeks prior to harvesting, it's vital maize crops are checked for harvest maturity. Good quality maize silage is best made when whole plant dry matter is between 30-40%. If harvested is less than 30% the silage stack will be wet resulting in stack leachate, this leachate represents nutrient loss. If greater than 40% DM, stack compaction and air exclusion is much more difficult. One important maturity indicator is the maize kernel milkline: where the milky liquid changes into the harder darker starch line. By simply snapping a cob in two and examining the upper portion’s kernels, the milkline can be seen. When the milk line is one third of the way up from the bottom of the kernel the plant is in the 28-32% DM range. Milk line is only indicative that harvest time in is near and there are other indicators needing consideration. In-field estimation of crop DM requires considerable experience, most contractors and technical advisors have experience in harvest scheduling and can offer advice on harvest maturity. Steep paddocks are not only difficult for cultivation and harvest but tend not to yield well. Low lying wet paddocks often lead to cultivation delays and often don’t yield well unless drought conditions prevail. A paddock that is wet under pasture acts as if 10% wetter when the structural strength of the pasture is removed by cultivation. Wet paddocks risk loss of soil structure under cultivation which leads to lower yields. Long-term effluent paddocks have high N and K levels and ideal for growing a deep-rooting crop of maize often without using bagged fertiliser. Long-term dairy pastures have high fertility levels with means N fertiliser inputs for maize crops can be reduced without impacting yield. To grow high-yielding maize on farm for the least cost, consider the factors which make the contractors' jobs speedy and efficient and reduce harvest cost, e.g. paddock location, access, entrance ways, track conditions, culvert strength, overhead wires. Maize seed is normally sown around 5cm deep. An uneven soil surface (undulations, ruts etc.) makes it difficult for the planter to sow at a uniform depth resulting in variable emergence. Maize does not need a very fine seedbed, it is a large seed and seed-to-soil contact is generally sufficient for germination, except on very cloddy soils. Light rolling after sowing may help seed-soil contact, seal in moisture, and reduce risk of wind erosion. 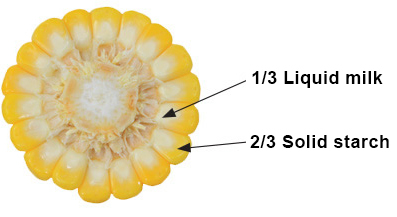 Maize requires substantial nitrogen (N) and potassium (K) both of which are present in dairy soils. On cropping farms, N is the nutrient most likely to limit maize yields and the largest fertiliser input. These inputs are generally unnecessary on dairy paddocks coming out on long-term pastures. Up to 300kg N/ha is released from soil organic matter when high fertility dairy pastures are cultivated. Maize is unlikely to respond to K fertiliser unless soil K test levels are very low. Replacement K fertiliser can be applied after harvest to avoid any luxury uptake by the maize crop (luxury uptake is the K uptake in excess of what the plant needs. K can be absorbed by plants in amounts higher than what is needed for optimum yield, this can lead to higher than normal concentrations of K in the plant tissue). Deep N test (0-60cm) for mineral N.
Dairy effluent can be used as a nutrient source for maize provided the crop requires the nutrients and good effluent practices are followed. For more information of nutrient requirements and dairy effluent for fertiliser see Best Management Practices for Growing Maize, pages 12-14. Paddocks out of long-term pasture often have a broad-leaf seed bank while paddocks previously run-out pastures often have grass weeds, e.g. summer grasses. Weeds can cause a significant yield loss, and moisture-activated pre-emergence herbicides generally work well - however in some situations further post-emergence applications are required. Minimising losses during maize silage storage - DairyNZ’s maize silage page. Maize silage is a maize crop cut and ensiled in a stack or bunker. It is commonly used as a supplement to pasture in situations where cows would otherwise be underfed. Maize can be used for green chop, maize silage, or maize grain. Other maize products include high cut maize silage, earlage, and high moisture corn, and kibbled maize.